While visiting some of the most popular destinations in Southern Thailand, such as the Phi Phi Islands, it was hard to ignore the nations severe plastic waste issue. It is suggested that Thailand consumes 4.4 billion plastic water bottles per year and the average Thai uses eight plastic bags a day. According to a 2015 Ocean Conservancy report, it is also estimated that just China, Indonesia, the Philippines, Vietnam and Thailand together, are responsible for over half of the plastic waste dumped into the ocean. It was evident that the growth of tourism in Thailand has resulted in several environmental issues. Phi Phi alone is under enormous environmental pressure, as a result of thousands of tourists arriving daily. The piles of rubbish at street corners and the food packages scattered all over the beaches has accumulated to Phi Phi producing an average of 25 tonnes of rubbish a day, with that number jumping about 40 tonnes during the high season (the time I visited). 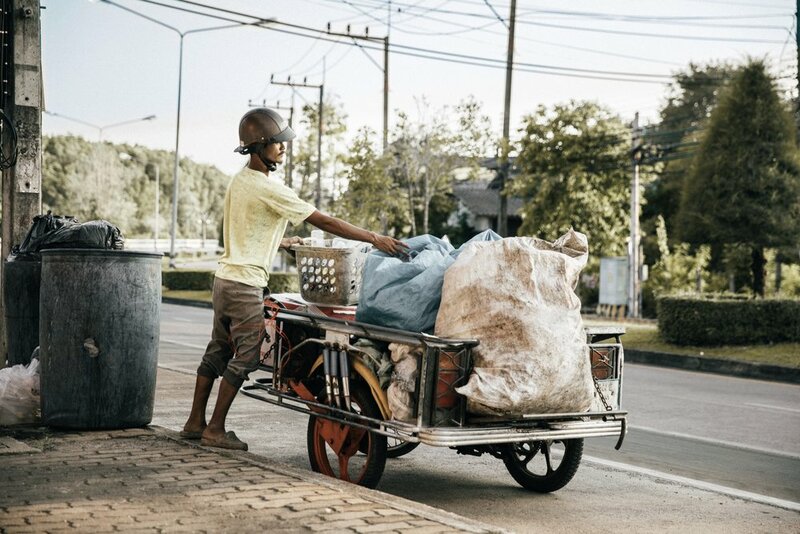 In response to this, the Thai Government has recently started running recycling programs, especially in the larger cities, that purchase various types of municipal and industrial waste from local businesses and individuals. I noticed that although Thailand faces serious environmental problems, it is more likely to see littered plastic bags, food waste scraps and food packaging than it is to see plastic water or soft drink bottles - as they are often collected. These programs have been implemented to encourage active participation from the local community and raise public awareness of not only the value of recyclable materials, but also the value of protecting the natural environment. Over the last few years, recycling has become an economic incentive for many individuals and small local businesses as there is the potential to generate a reasonable income from the collecting and sorting of recyclable materials. While wandering the streets of Karon Beach, we came across a restaurant with a several crates filled with Coca Cola bottles, waiting to be purchased. My boyfriend also captured a few shots of a local man picking out and sorting plastic bottles from a roadside garbage bin, while adventuring around Krabi Town. Locals and tourists also have the opportunity to take part in regular Trash Hero clean ups, that operate from several popular spots, including Phuket, Ao Nang and Railay Beach. Trash Hero is a sustainable, community-based project, that operates all over South East Asia (as well as a few cities in both Europe and the USA). The program aims to removes existing waste, and reduce future waste by inspiring long term behaviour change. The further building of public and tourist participation and environmental awareness in Thailand will not only have positive ecological impacts, but also economic and social benefits. The attractive point of recovering waste materials is a chance at a better quality of life and a form of income for Thai people, all while indirectly reducing the demand for fossil fuels and improving the appearance of Thailand's streets and beaches.